Working as a clinician for many years, one of the most common questions I would get is, “What can I take for more energy?”. It was always a tough question because I knew I’d just be treating a symptom by giving them energizing natural supplements like maca, cordyceps, and ginseng. Sure, it’s better that they didn’t ask a drug dealer the same question. In the immortal words of Rick James, “Cocaine is a helluva drug…” But, I didn’t want them to see me like a natural pill-pusher, and get them hooked on something just to get them by, either. So, I dedicated myself to helping them get to the root of their energy problems. And today you’ll learn the very best of what I came up with. 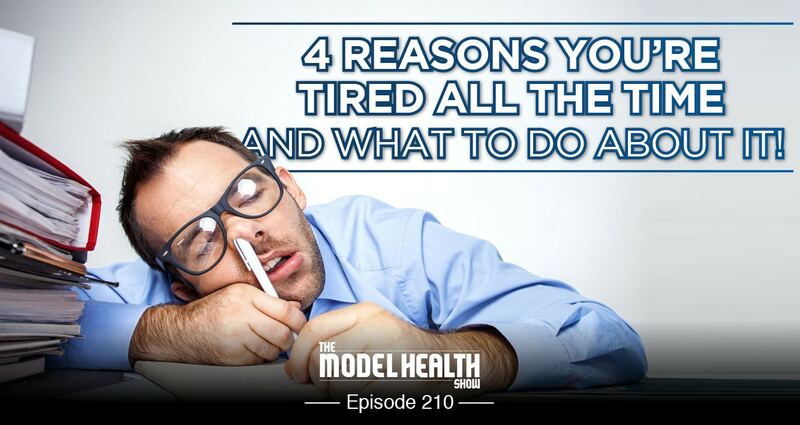 How my struggle with chronic fatigue began. A potent superherb that’s clinically proven to improve insulin sensitivity. What going to the gym is compensating for. How you’re able to literally charge up your cells like a battery. The surprising amount of energy the human body can generate. Simple strategies to get in more nutritious movement throughout the day. Why you can still wake up exhausted after 7 to 8 hours of sleep. How many total sleep cycles you need for optimal energy. What happens in your brain during sleep. The 2 major things that can disrupt your sleep cycles. Key nutrient deficiencies that cause fatigue and sleep problems. The #1 mineral that supports human energy production. How dehydration impacts energy (and how much water you really need!). EASE ⇐ Get an exclusive 15% off here! The Model Health Show Episode 204 – Live From D.C. The Essential Guide To Maximizing Your Energy ⇐ Get the powerhouse new course here! I am a brand new listener to your show and cannot stop listening! I love the content and I am putting everything in play right away. Most of the time I listen on the road, and cannot take notes/answers about the topics. For me, I would love to go back and see a brief answer to the topic in the description of the podcast. Then I remember the conversation, write down, and start utilizing that information. Whether you are talking about a workout, nutrition, a product or supplement, life lesson, sleep lesson, etc.. I see the you’ll discover section about the topics, but that last bit of information will help me a lot. I also know time is an issue and I am not expecting a novel. Thank you again for the great information! Been listening to some of your shows. One episode told me jogging is a waste of time the next tells me that all movement is important and even chopping herbs is worthwhile! Bit confused. I should apply by myself these 4 tips. Has Shawn Stevenson ever addressed HYPERSOMNIA. I’ve struggled with this neurological disorder for over 15 years. Doctors have no cure for it or understand why it happens, specially Idiopathic Hypersomnia. Please let me know. Thanks. Hi! Love all of your info…loved your book and I’m hooked on your show! Quick question for you – You mention magnesium a lot. I know there are many kinds of magnesium. I have been curious about the spray magnesium you mention. I have tried a gel with no effects. I currently take an oral magnesium glycinate and do not experience the effects of having to go the bathroom a lot like people mention with other types. Which type should we be taking and what is the difference between them?